Get your genes to work in your favour, lose that weight and keep it off. you tweak your diet and lifestyle. Timeframe: 15 to 20 working days of receipt of DNA samples. The DNA Diet and Healthy Weight Test detail how certain genes we all carry interact with how the body processes various foods, mineral, vitamins and more. If you want results and to stop the guess work, a DNA diet and Healthy Weight Management test is a must! Would you like to learn about genetics and its influence on your diet? The DNA Diet and Healthy Weight Test diet can help you to look at your food intake and then give you the tools to enable you tailor your diet to ensure it is optimal for your health and genetic profile. 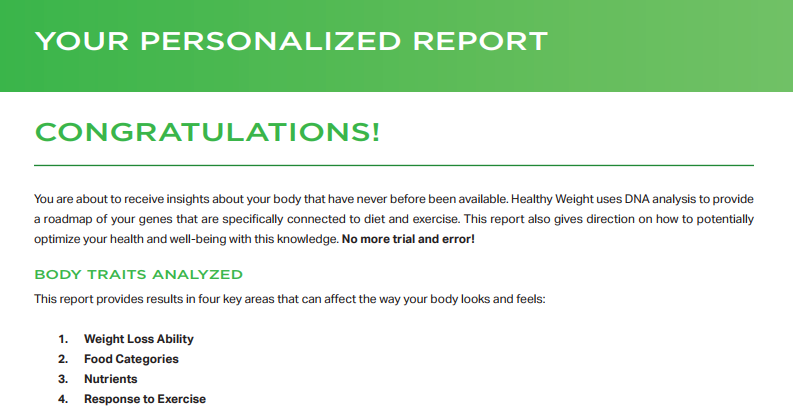 By looking at your DNA results and genetic predisposition we can provide answers to questions about how your body processes carbohydrates, proteins, fat, micronutrients as well as highlighting the effectiveness of various types of training vis-à-vis your genetic profile. Results are ready in 15 to 20 working days from receipt of samples. • Different people have different calorific needs. Understanding the ideal foods to eat by having the essential information provided by this DNA test is crucial for your weight management. • The way we store nutrients and the nutrients we need can vary considerable from person to person. Get insights into what are your optimized nutrient needs and what supplements might it make sense for you to take. • Fitness and exercise are two very complex words. There are several types of exercise such as resistance training or endurance training. What exercises work hand in hand with your genes and which does not? The DNA Diet and Healthy Weight Test kit allows you to make informed decisions about your diet and lifestyle. All you do is order the kit, follow the instructions and send your sample back for the lab to analyse. Our laboratory extracts the DNA and looks at specific genes which affect your individual response to the various foods we consume, micronutrients, vitamins etc. Once your DNA has been analysed and report completed, you will receive a personal report of your results. The testing kit arrives with a pair of mouth swabs, sample collection instructions together with a pre-addressed return envelope to use to send your samples back to us for analysis. We recommend that you send your samples by recorded or special delivery. Who Can Purchase the Diet DNA test? The test can be ordered from anywhere in the world. You must be of legal age in accordance with the laws in the country in which you live.